Just a quick post, due to intense work which has kept me away from Flickr for a couple of weeks, whilst my grandfather’s recent death has taken up some personal time as well. Jarnail was a great guy to meet and I feel hugely guilty that sharing his pictures has been delayed. We meet in Soho after a day shooting with bomvu. His incredible turban and Canon camera (good choice, sir) stood out and necessitated my asking for a moment of his time and a portrait. It turned out Jarnail is a model for a traditional music and cultural troupe, and that came across in his fantastically intense eye contact and posing. 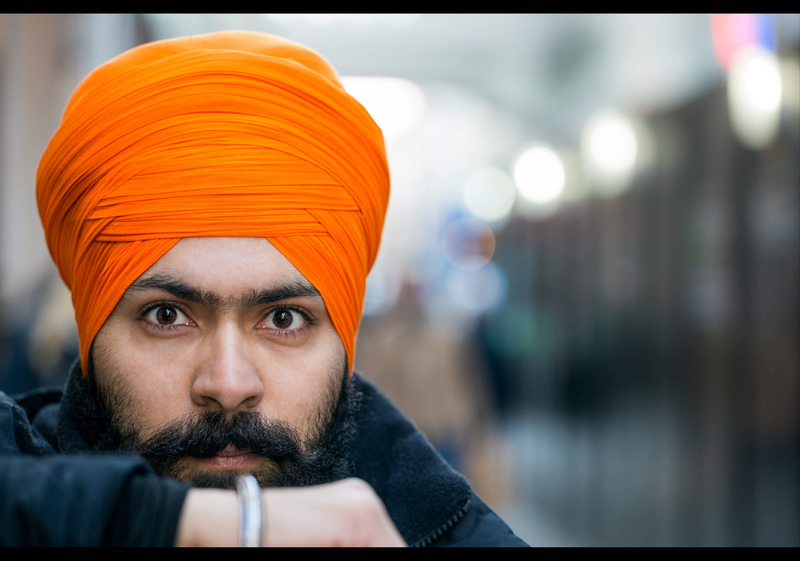 My first few shots were a little wayward as I experimented shooting full length, but after a good twenty minutes learning about the significance of his turban and Sikhism in general, we took a moment to grab some headshots. There’s one in the comments, perhaps a nicer crop with the extra step back. I went with the main shot though, as the other has a slightly distracting lady and bag, and the impact of Jarnail’s challenging stare is a notch higher. Thanks for taking a moment to stop Jarnail – and for your patience whilst I processed your shots. I how you like them and hugely encourage you to get involved in the project yourself. You’ll love it. This is portrait #23 of my 100 Strangers Project – check out the group page and get involved.